Feeding the 5000 will hold an event in Dublin on 24 November where 5000 people will be fed a free meal using food that wouldn’t reach supermarkets – despite being perfectly edible. NOT EVERYONE THINKS about food wastage – but it is estimated that 30 per cent of food produced for human consumption is lost or wasted across the world’s food system. With a recent EU study estimating that annual food waste generation in the EU27 countries is approximately 89 million tonnes, with one million tonnes of that in Ireland, it is clear that food waste is a very pertinent issue. The average person in Ireland generates about 280 kilos of waste each year, StopFoodWaste says. In developed countries, like Ireland, food is thrown away even if it is still suitable for human consumption. It is estimated that a third of the food bought in the supermarket in Ireland is thrown in the bin, costing each household around €1,000 a year, according to StopFoodWaste. One person who is trying to do something about this is Aoibheann O’Brien, who is one of the people behind the upcoming Irish installment of Feeding the 5000, which will take place on 24 November in Wolfe Tone Park (near the Jervis St shopping centre) in Dublin. The aim of the event is to feed 5,000 people from food that would otherwise be wasted, with the aim of raising awareness of the amount of food we waste in Ireland. 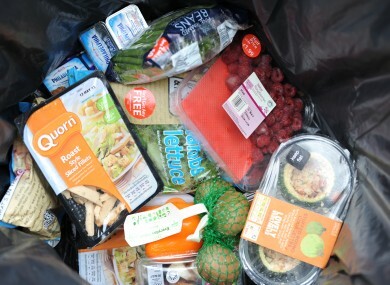 It also aims to highlight the positive solutions to food waste. O’Brien explained to TheJournal.ie that last February she and a friend set up a social enterprise that involved redistributing food that would otherwise go to waste (from companies, food markets, etc) to charities in need of food. They then began making an app, which is still under construction. From there she got involved with another group trying to set up a national network of food banks, Bia Foodbank. She then got in touch with the food waste guru Tristram Stuart, who wrote a book about food wastage, Waste, Uncovering the Global Food Scandal. He ran an event in Trafalagar Square called Feeding the 5000, where 5000 people were fed with food that would never have made it to a supermarket, and now O’Brien and others are bringing this event to Dublin. The food isn’t food that has been in supermarkets – it is food from Irish producers that wouldn’t meet the supermarkets’ strict standards, even though it is perfectly edible. The food which isn’t sold to supermarkets in Ireland is generally used for animal food, “which is fine”, said O’Brien, but “at the same time when you think of all the water and energy that went into growing the food, it is a waste of resources”. All the food at the event will be vegetarian to emphasise that growing vegetables saves more energy than raising animals for meat. There are three classes of vegetables, class 1, 2 and 3. “Supermarkets only really take class 1 as they get a better price for them so they can charge higher,” explained O’Brien. On 24 November, they will be getting the fruit and veg from the Meade Potato Company, who has kindly agreed to donate the food to the good cause. People are encouraged to come along to the event, eat the free meal, but to make a pledge that they too will cut down on their food waste – and to tell a friend about the initiative. On the day, which runs from 12 – 5pm, Tristram Stuart will give a talk at 12.30pm while there will also be cooking demonstrations from experts including Tony Keogh of Cornucopia Restaurant. Feeding the 5000 is sponsored by Voice of Irish Concern for the Environment, Stop Food Waste, Bia Food Bank and Food Glorious Food. Find out more on the official website. Email “Feeding the 5000: How food wastage inspired a movement”. Feedback on “Feeding the 5000: How food wastage inspired a movement”.